Unions from across the world have been sending messages of support today to UNISON’s higher education members, who are striking against a 1% pay offer. Do you know of any members who have been off or are approaching 6 weeks sick leave? If you do, we would like to send them a card which includes a pre-paid return slip for the member to choose a gift of fruit, flowers or chocolates. Just contact your local steward or officer, details here unisonshu.org.uk/contacts or contact Joanne (Branch Administrator) at unisonadmin@exchange.shu.ac.uk with the member’s name and department. Universities and colleges have been operating with skeleton staff with UNISON members attending rallies up and down the country in a walkout over pay. Staff working in a wide variety of jobs including course administrators, caterers, cleaners, security staff have caused widespread disruption in 21 towns and cities. Walkouts have forced the closure of libraries, health centres and food courts, with several universities cancelling classes before the industrial action started. 250 employees attended a rally in Bristol, while 80 union pickets covered building entrances at universities throughout the north-west. 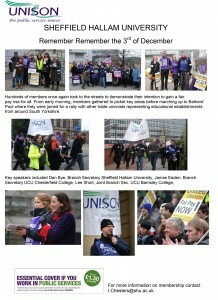 UNISON members occupying an empty car park at Staffordshire University received widespread support from students. The union has labelled the offer of a 1% pay rise “miserly” as cash-rich universities continue to pay more than 4,000 staff less than the Living Wage, which stands at £7.45 and £8.55 in London. “Our members are the backbone of universities. They work hard to support students on campus, they run the libraries, take care of course administration, feed the students, keep them safe, clean their accommodation and university premises, and yet their contribution to university life is so often overlooked. UNISON has confirmed that alongside its sister trade unions UCU, Unite and EIS fresh talks will be held with the employers in an attempt to resolve the current dispute over higher education pay. 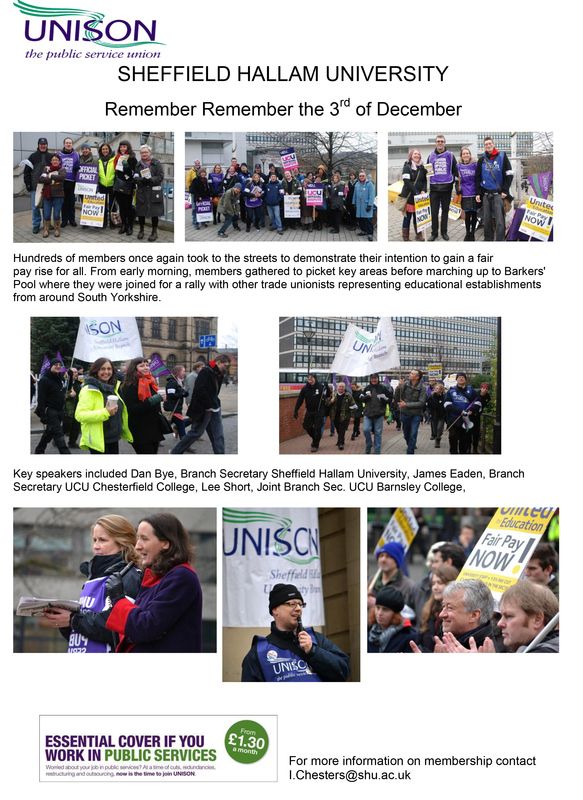 UNISON members alongside their colleagues from UCU, Unite and EIS are due to take a second day of strike action on 3 December 2013 in response to the current offer of a 1% salary increase for staff. But all parties have agreed to use ACAS to facillitate exploratory talks on a resolution at a meeting on 26 November 2013 at the ACAS offices in London. UNISON has expressed its disappointment that the national HE employers organisation UCEA has provocatively suggested to universities that they can choose to pay their 1% pay offer “on account” to staff, whilst the current dispute over pay remains unresolved. After an early start on picket lines hundreds of staff from both universities joined forces to march around the city centre to protest about pay. Students demonstrated their solidarity by marching with university staff. The rally made its way to Barkers Pool at midday where speakers, including Simon Renton, national president of UCU, and Hallam UNISON Branch Secretary Dan Bye, addressed the large gathering to outline the reasons for the protest. Police officers with the rally approximated 300 to 400 strikers were active. The new Local Government Pension Scheme (in our region known as the South Yorkshire Pension Scheme) comes into being on 1 April 2014. The Public Service Pensions Act became law in April this year. This legislation was necessary to allow the existing schemes to be changed, and the detail of how the scheme will work in included in draft regulations currently out for consultation (https://www.gov.uk/government/consultations/local-government-pension-scheme-2014). For more information on the progress of the design of the new scheme, see: http://www.lgps2014.org/. UNISON has concerns about the extension of “fair deal” protection to LGPS members, which has not yet been finalised. “Fair deal” means that if a public service is privatised, workers are allowed to maintain membership of the LGPS. UNISON believes that this protection was built into the agreement on reform of the LGPS and that therefore all scheme members should be covered, and is making representations to that effect. The UNISON Higher Education Service Group Executive (HESGE) is urging members to strike for better pay, following the employers’ refusal to improve the 1% offer. UNISON believes that the money is available for a better pay increase, and that Higher Education employers can afford to improve on their offer. Over the last 5 years, as a result of pay rises below the cost of living, our lowest paid members have lost the equivalent income of between £663 – £1173. UNISON believes that no employees in higher education should be paid less than the national Living Wage and that it is time for incomes for everyone in the sector to match the rising costs of living. According to a recent freedom of information request, the median pay of the highest paid members of staff in the higher education sector (including pension contributions and other pay related elements) was £242,000 with the highest paid employee receiving over £500,000 per year! There is money available for some – we believe it should be available for all. UNISON believes that evidence from the employer’s shows that the financial position of the higher education is healthy and shows signs of expansion with the number of employees in the HE sector showing an increase for management, academic and support staff by over 4,000 between 1/8/11 and 1/8/12. Although during the same period some universities have made redundancies, this is not reflected across all HEI’s and we believe that this is further evidence that the sector has the money to make an improved pay offer that fairly reflects the contribution of our members. The HESGE believe that the only way for an improved pay offer from the employers is for members to take strike action, and show the University employers that enough is enough and that pay matters. UNISON consulted members on whether the offer should be accepted, and the majority of those responding said they would not accept it. Therefore the HESGE has decided to ballot members for industrial action in September. If members vote for action, this would be likely to take place in the autumn. Remember: your vote does count. We will be arranging Branch meetings to allow members to discuss the pay offer and campaign for a better deal. It is important that before the ballot we have accurate contact details for all members. In our branch we have done a lot of work over recent years to make sure that our records are up to date. However, we know that members are constantly on the move, and so if you have changed your name, phone number, email address or postal address, please make sure you have told us. You can update your details by emailing Jo, our branch administrator. Or call UNISONDirect on 0845 355 0845. Come along to Wortley Hall on Saturday the 6th July for a great day out for all the Family! Enjoy lots of wonderful stalls brimming with crafts, food and gifts, falconry displays, pony rides, exotic animal handling, brass band, dancers, face painting, coconut shy, bouncy castles, rides and games. The South Yorkshire Festival is support by the trade union movement.